Wait. Back up. Why didn’t anyone warn me about this movie? You know, the whole Ohana means family and family means nobody gets left behind and a freakin cute-as-heck blue mutant pet learns to love one? Yeah. Talk about a bawl-fest at my crib last night. My friend and I had a Disney movie marathon last night. A pack of tissues may have been lethally wounded over the course of the evening. The event might have involved the unleashing of an entire army of Disney stuffed animals. We also might have had delicious food that my friend made for us. Again, whether or not I own something as embarrassing as stuffed Disney paraphernalia, I’ll let you decide. As you can tell, I plead the fifth on that count. No self-incrimination here. There may have been a tad more guilt involved in the making of this amazing amalgamation, which was entirely in keeping with the theme of Stitch’s rather mutant, unknown history. And really, what better way to celebrate a fictional account of an alien apocalypse in Hawaii than to make a fun, tropics-themed dessert? If you didn’t already know, this stuffed cookie was inspired by the challenge Julie is hosting over at Willow Bird Baking. As you’re no doubt aware, she’s a fantastic gal and it’s always a pleasure creating things she’ll happily share! The only problem with rewatching Disney films that you haven’t seen since you were about yay high (imagine me Lilo-sized–not that I’ve really grown since the fifth grade) is that you pick up on so much more that you never noticed the first time. Crying during the ohana scenes. Check. Understanding the total MAIN STORY about Lilo getting taken away from her big sister. Did not see that the first time at all. Check. Wanting my own personal cuddle buddy Stitch. Uh, yeah. Definitely check. And bonus points for making it happen, too. Yeah, I’m going to make one sad, batty old lady when I grow up. I’m going to go hug my Stitch now. In the meantime, though, why not listen to the anthropomorphized blue blob and try making a batch of these pina colookies (pineapple cheesecake-filled white chocolate coconut cookies)? Cream together butter and sugars. Beat in egg. Mix in vanilla extract. Dissolve baking soda in hot water. Add to mixture, along with salt. Add flour and stir until just combined. Fold in white chocolate chips and coconut. Place in freezer for 20-30 minutes, until dough is relatively stiff and easy to handle. To make filling: Combine all filling ingredients in a medium bowl. Preheat oven to 350 degrees F. Place a small ball of chilled dough onto greased cookie sheet and press down gently with your thumb in the middle so that you create a small indentation. Fill with a small teaspoon-ful of filling. Place another ball of dough of equal size on top and wrap around filling, sealing sides of dough so the filling doesn’t leak when baking. Continue shaping cookies until all dough and filling is used. Bake cookies in preheated oven for 14-16 minutes, or until golden brown. I haven’t seen a Disney movie in years! Probably I should again. I really enjoy pineapple, so I know I’d like these – and the cream cheese is such a nice addition. Really good stuff – thanks. Oh gosh–make sure you grab Mrs. KR and get to your VCR, quick! While eating some pina calookies, preferably, of course. What a fun night to have Disney movie marathon! As much as my kids love Disney stuffs…I don’t think I’ve watch this one. Gotta check it out. 🙂 Your Pina Colookies look and wound wonderful, especially with the surprise inside. 🙂 And your mickey pancake is perfect done too. So cute. Yes, and make sure your kids watch it with you! It’s such a great family film. 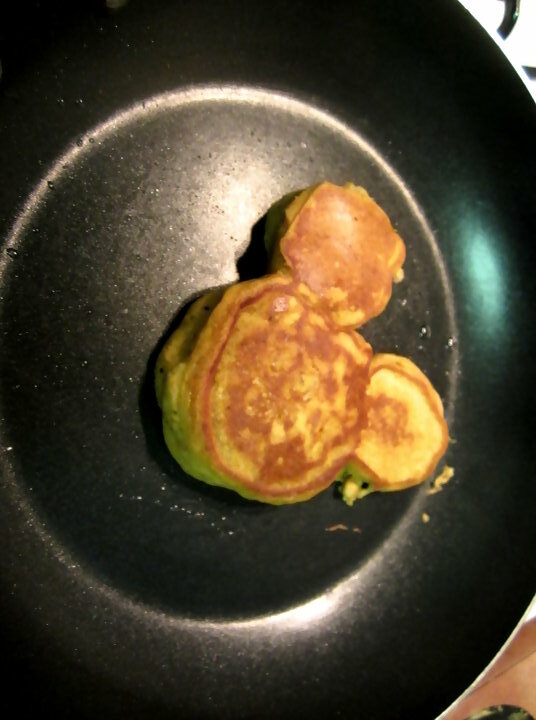 The pancakes were delicious, I’ve got to remember to make your Mickey macaroons next time, Amy! This is an amazing share. Thanks for this writing. Sorry for the late reply (your comment somehow found its way into my spam folder!). I’m glad you enjoyed reading, thank you for taking the time to stop by and comment!